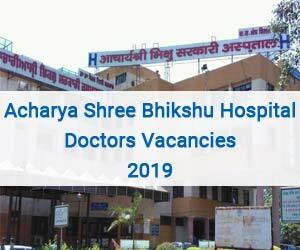 New Delhi: The Acharya Shree Bhikshu Government Hospital, New Delhi (ASBGH New Delhi) has released 08 vacancies for the post of Senior Resident on Regular Basis. The selection will be done on the basis of Walk-in-interview. Applications are invited in the prescribed format from eligible candidates for making a panel for appointment against existing and future vacant posts of Senior Residents for a period of one year in case of SRs extendable upto a maximum period of three years with annual extension provided that the service rendered / work and conduct has been found to be satisfactory. The applicants to report with duly filled prescribed form self attested copies of all testimonials and passport size photograph in Estt. Section (IIIrd floor) on 26.03.2019 (Tuesday) at 9.30 a.m( till 11:30 a.m.). The Vacancies are in the Department of Obstetrics & Gynaecology, Pediatrics, Radiology, ENT, Orthopaedic. Eligiblity Criteria for SR’s: Post Graduate Degree / Diploma from a recognized university & enrolled with Delhi Medical Council with Post Graduate, Degree / Diploma. Not more that 37 years for SRs (5 Yrs. Relaxable for SC / ST and 3 Yrs for OBC) as on date of Interview (vide order No. F.No. DHF&W/Q015/57/2016-HR-Medical-Secy (H&FW)/CD No. #112425062/2413- 16 dated 04.07.2018). Pay matrix of Level I I (Rs. 67700-208700) other usual allowances as admissible under the rules. The applicants to report with duly filled prescribed form self attested copies of all testimonials and passport size photograph in Estt. Section gad floor) on 26.3.2019 (Tuesday) till 11.30 A.M.
1. Candidates must have a valid DMC Registration Certificate. 2. The number of vacant posts may vary. 3. SC / ST Certificates issued from Judicial /.Revenue Authorities and OBC Certificates issued from Govt. of Delhi shall only be accepted. Further reservation to Handicapped candidates shall be given as per rules. 4. In case of Non availability of candidates under SC / ST/ OBC Category, vacancies may be filled up from the General category and vice versa on ad-hoc basis. 5. For Physically Handicapped candidates. Relaxation is admissible as per Govt. of India Rules. 6. No TA/DA shall be admissible for attending interview. Date of Birth, Contact No., E-mail ID, Address, DMC Registration No., Date of Internship completion. Educational Qualification, Attempts Certificate and experience, if any. 8. The applicant under relaxed eligibility criteria as per instructions contained in Circular No. F.No. F.No. DI 11.`&11’/Q015/57/2016-11R-Medical-Seey (11,NtliV)/CD No. II 1 12425062/2413-16 dated 04.1)7.2018 of Health & Family Welfare may apply i.e. who have completed three years of Senior Residency, for SR Ship. I lowever, they will be appointed only in case of non availability of flesh eligible candidates anda separate list will he prepared for them. 10. In ease of SR, Separate merit lists for fresh candidates and for other (those who have completed 03 years of Senior Residency already) would be prepared. 11. The decision of the Medical Superintendent will be final. In case of any dispute the jurisdiction of court will be Delhi / New Delhi.